My generator can produce sine- and squarewaves with frequencies between 1 Hz and 100 kHz and amplitudes ranging from zero to 1.55 Veff in 600 Ohms. Sinewave distortion is 0.1% or less between 20 Hz and 20 kHz, somewhat greater outside this region. The output voltage varies less than 0.1 dB within the audio range (20 Hz to 20 kHz); there is some rolloff (less than 1 dB) at the frequency extremes. Most sinewave generators (including the circuit from publication 1) can be tuned continuously over a 1:10 range of frequencies, using a stereo potmeter (audio taper). Inspired by reference 4, I used a different approach. My generator is tuned in small steps (0.1 on a log scale) using a dual rotary switch with 12 positions. The resistors wired to the switch are accurate within 1%; proper values are obtained by wiring standard resistors in series. Much better tracking is obtained with a stepped attenuator than with a common stereo potmeter, resulting in lower distortion. Resistor values can be calculated with the formula: f = 1/(2*PI*R*C), in which PI = 3.14159 (R in Ohms and C in Farads). The capacitors which I employed were also selected for low tolerance (accurate values), using a digital capacitance meter. They are wired to a dual rotary switch with 5 positions, corresponding to 5 frequency ranges. Measured frequencies produced by the prototype are shown in Table 1. You will notice that lower frequencies are produced than would be expected from the formula when C=680pF. This is normal and due to stray capacitances within the circuit. The sinewave generator is based on 4 op-amps which are present in a single TL084 i.c. (see fig.1). Op-amps A1 and A2 are connected to the frequency determining RC networks R5+P1a/C1 and R6+P1b/C2, respectively. In my version of the generator, P1 is replaced by a stepped attenuator (dual rotary switch with 12 positions, see above). Moreover, I have included two additional frequency ranges; thus, S1 is in my version a dual rotary switch with 5 rather than 3 positions. The combination of RC network and inverting amplifier causes a 90 degrees phase shift at a frequency determined by the RC time of the network. The two stages (A1 and A2) in series have 180 degrees phase shift at that particular frequency. Inverting amplifier A3 causes an additional 180 degrees phase shift and it provides sufficient gain to allow the system to oscillate at the selected frequency (a combined phase shift of 360 degrees corresponds to positive feedback). Capacitor C5 has been added in the feedback loop of A3 to suppress undesired parasitic RF oscillations above 100 kHz. The output voltage of A2 and A3 is rectified by the diodes D1 and D2 and fed to the inverting input of A4 via the variable resistor P3. The opamp A4 compares this rectified voltage with a reference voltage which is provided by the zener diode D4. The apparent drain-source resistance of FET T1 is dependent on the difference between output and reference, since the gate of T1 is driven by opamp A4. Thus, the input voltage of A3 is continuously adjusted and the output of the generator is maintained at a constant level. A number of precautions were taken to ensure proper operation of the amplitude stabilizing circuit. Capacitor C3 in the feedback loop integrates the input signal of A4; C4 and R12 have been added to suppress bouncing of the regulatory mechanism. Diode D3 was added to provide overload protection for the gate of T1. 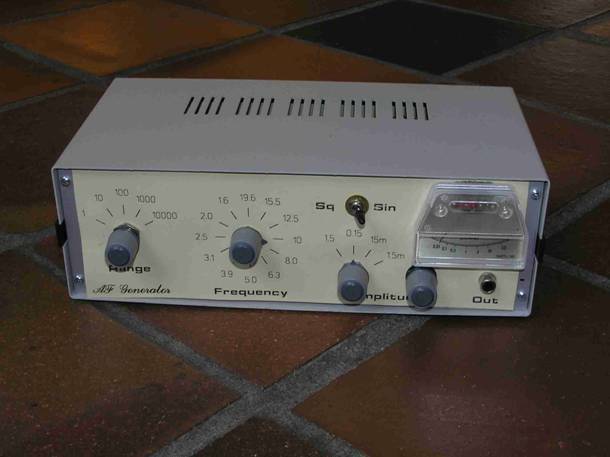 The article in Elektuur specified a BF256C for T1; I replaced this by a BF245C since I had that FET in my junkbox. Amplitude stabilization with a JFET normally results in a distortion of the sinewave of 1% or more, but the ingenious circuit of mr.Mieslinger causes distortion to remain below 0.1% over the audio range. Alignment of the generator proceeds as follows: Set P3 in center position and adjust P2 until the DC voltage at the output of A4 is between -1 and -2 V. Then adjust P3 until the output voltage of A3 is 1.55 Veff. Keep all wiring to S1 and P1 (in my version, S2) as short and neat as possible to avoid stability problems or dips in the output. My (relatively neat) prototype works so well that the range of operating frequencies could be extended from 20 Hz - 20 kHz (Elektuur specification) to 1 Hz - 100 kHz. Not bad for a cheap op-amp! 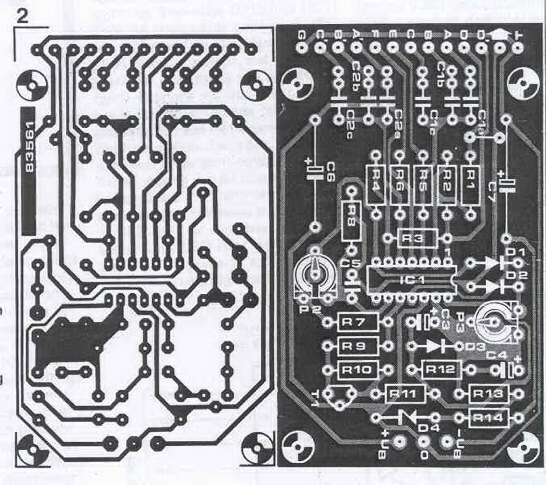 The layout of a PC board for the generator is shown in Fig.2. The sine is transformed into a squarewave by a simple and efficient circuit (see Fig.3). Transistors T8 and T9 form a classical Schmitt-trigger. Emitter follower T10 ensures low output impedance. RF transistors are used to allow rapid switching and a large bandwith. The trigger level is set with the variable resistor P5; symmetry of the squarewave is adjusted with P2. In my version of the sine-to-squarewave converter, a signal LED is not included. P2 is connected directly to the +15V lead of the power supply; the negative pole of C6 goes to ground. A PC board for the Schmitt trigger is shown in Fig.4. An output buffer was added to isolate generator and Schmitt trigger from the load. The simple circuit described by Rod Elliott on his website (see Fig.5) has low distortion and can easily drive a 600 Ohm load. Rod used a ±12V supply, but the circuit works equally well on ±15V. I have hardwired the buffer in dead bug style on a piece of unetched PC board, using the copper as a groundplane. This simple circuit provides a visible indication that the generator is switched on and is producing an AF signal. The 200 Ohm trim pot should be adjusted until 1.55 Veff produces a full scale reading on the meter. Output voltages of 0.5-1.5 Veff lead to different meter readings. If the output attenuator (see above) is built not with 1:10 but with 1:3 steps, every value of the output voltage can be directly monitored. The circuit is so simple that all parts could be glued to the back of the 500µA meter (cannibalized from an old Panasonic amplifier). 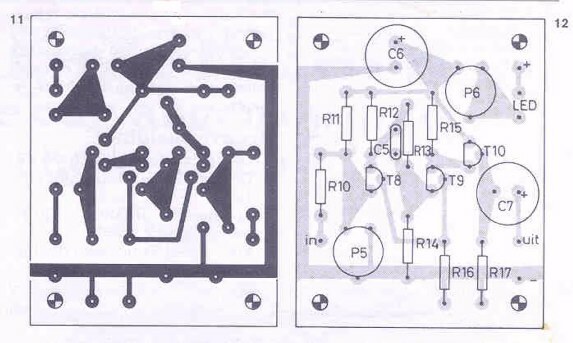 W.Mieslinger, RC-generator, Elektuur, July/August issue, pages 70-71, 1983. L.Boullart, Semi-professionele LF generator, Radio Bulletin, October issue, page 409ff, 1982. W.Olthoff, RC-generator, from the book: Meetinstrumenten voor zelfbouw (A.J.Dirksen, ed. ), pages 51-62, Deventer: Kluwer 1969. Finally, a picture of the finished contraption….